Encephalitis playing havoc in north Bengal, where 102 people have died, has spread its tentacles to Assam as well taking 43 lives there. In the last two days, 42 people have lost their lives in the disease in the seven north Bengal districts, particularly Jalpaiguri, the worst affected. "Around 102 people have died so far," West Bengal Director of Medical Education (DME) Dr Susanta Banerjee said. 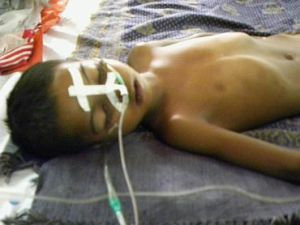 The toll from encephalitis in north Bengal was 60 till Sunday. The DME said that it was a case of mixed infection with Japanese Encephalitis being responsible for around 24 per cent of infection. The situation has been described as 'alarming' by West Bengal Health Services director Biswaranjan Satpathy. Dr Amarendranath Sarkar, the superintendent of the North Bengal Medical College and Hospital, in Siliguri where the affected have been admitted said that most of them have been coming from near Jalpaiguri and Cooch Behar districts and areas surrounding Siliguri. From July 7 till yesterday, 60 people died of encephalitis in North Bengal Medical College and Hospital in Siliguri. In Assam Japanese encephalitis has claimed 43 lives and affected 311 people, according to Health Department data. Lower Assam districts of Barpeta, Kamrup (Rural), Darrang and Nalbari districts have been worst affected, the data revealed. Of this, Barpeta reported eight deaths and 54 positive cases while Kamrup (Rural) reported four deaths and 34 cases of Japanese Encephalitis during the last week, according to health department data. Darrang, Sivasagar and Nalbari have reported six deaths each with 20 confirmed positive cases in Nalbari alone while two deaths were reported from the Kokrajhar district.